Sports Reporter Jordan Ingram for FishDuck.com from Matt Knight Arena in Eugene, Oregon. Eugene, Ore. — Dwayne Benjamin saved the Ducks from a loss at home with a clutch 3-pointer with 7.6 seconds remaining in regulation to tie the game against UC Irvine to send the game into overtime. Joseph Young finished the game off in OT with a great 3-pointer that led the Ducks to a 69-67 victory over the Anteaters. The teams exchanged leads throughout the first and second half. Benjamin finished the night as the overall leading scorer with 18 points and freshman Dillon Brooks had a monstrous game with 15 points. He was a dominating presence in the paint, providing the Ducks with rebounds and second chance shots that kept them in the game. 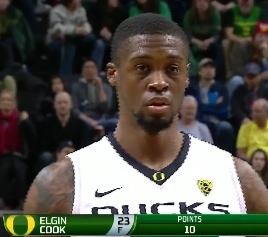 But it was Elgin Cook who was arguably the difference maker for the Ducks in this game, scoring 14 points, 8 rebounds, 5 assists, and 4 steals. 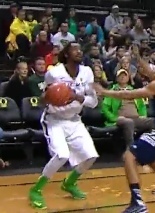 Cook was everywhere and caused problems for UC Irvine all night. The Ducks led most of the first half, jumping out to a 9-2 lead after a layup from Benjamin. But after Joseph Young struggled to sink shots, UC Irvine took advantage and took the lead, 24-22, thanks to an Aaron Wright jumper with 4:13 left in the first half. By the end of the first half, UC Irvine led the Ducks, 33-26. Early in the second half, the Anteaters grew their lead to 11 points before the Ducks sparked a comeback. A steal by Cook with 17:50 remaining was the catalyst that brought the Ducks back to life, followed with two unanswered 3-pointers by Ahmaad Rorie and Joseph Young which closed the gap to 41-36 with 15:41 remaining. The Ducks’ defense was stout in the second half, thanks in large part to Jordan Bell who grabbed eight rebounds, six of them on defense, making it difficult for UC Irvine to add to its lead. 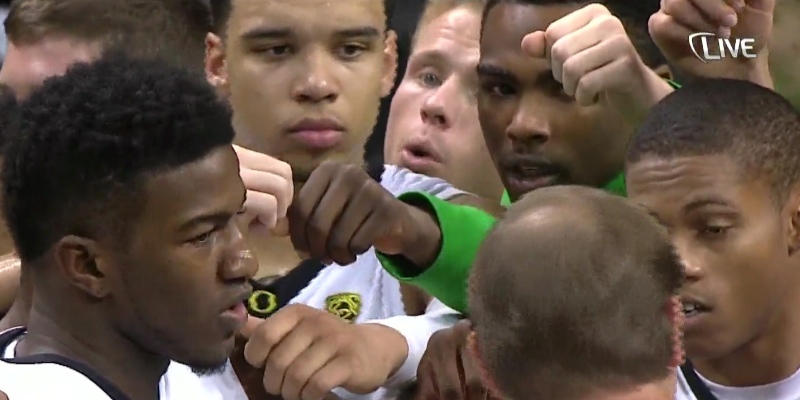 The Ducks kept chipping away and eventually pulled within 2 points at 55-53 with 2:31 left in regulation. After UC Irvine’s Travis Souza’s jumper made it 57-54, Benjamin hit another 3-pointer to tie the game. It was in overtime that Young finished off the visiting Anteaters with a 3-pointer. They couldn’t recover, giving the Ducks the win, with a final score of 69-67. The Ducks improve to 10-3 this season and to 9-1 at home and will play their first conference matchup against Oregon State on January 3rd at 5 pm PT.